Size: The typical shell length of adults is about 9-10 cm, reaching a maximum of 15 cm. 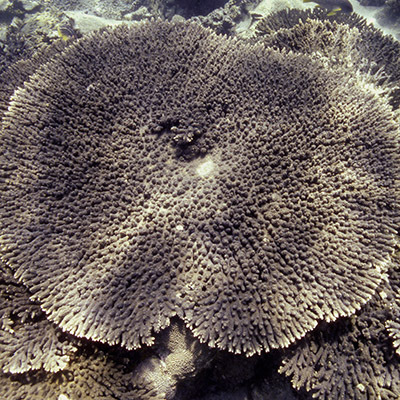 Textile Cones live in the intertidal and shallow subtidal zone, where they are very common in clean sand, often hidden beneath stones and coral slabs, but are also found in coral areas, normally at depths of about 10 m. The animals shelter at daytime and come out to hunt at night, preying mainly on small coral fishes, worms, dead cephalopods and peeled shrimps, but also on many species of other sea snails. They are known to be cannibalistic after a long time of starving. Like all species within the genus Conus, these snails immobilize and kill their prey by means of harpoon-like hollow teeth that are rapidly jabbed into the prey to inject a highly toxic venom called conotoxin. 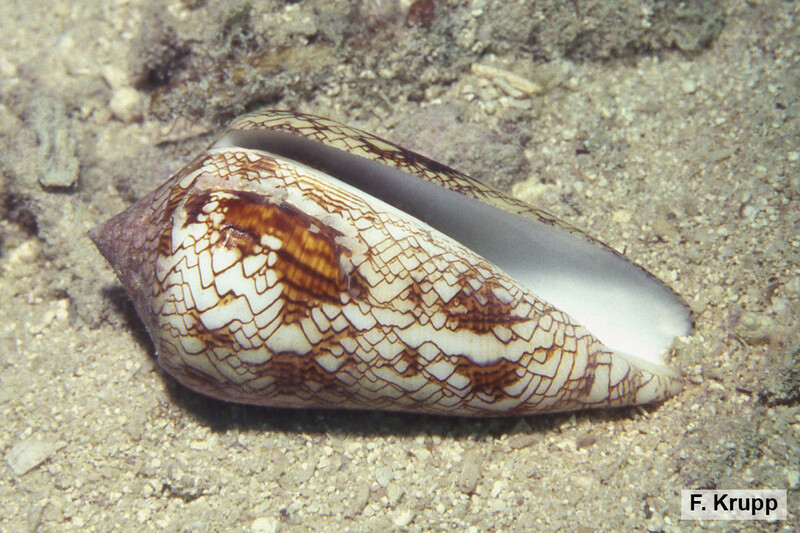 Cone snails are among the most venomous creatures on earth. Live individuals of this species can inflict bites that are not only painful, but have reportedly caused human deaths, and should therefore be handled with extreme caution or not at all. This cone species is widespread throughout the Indo-Pacific region, from eastern Africa and the Red Sea to French Polynesia, north to Japan and Hawaii and south to Australia (New South Wales) and New Zealand. The IUCN Red List of Threatened Species classifies Conus textile as Least Concern (LC) in its global assessment. Shells of this species are traded internationally for the collector market and gathered locally for and by tourists. The animals are also being used in pharmaceutical research. The Textile Cone is a medium-sized to large species with a heavy shell that has a highly glossy surface. Its last whorl is elongated and convexly conical to cylindrical in shape, with rounded or slightly angled shoulders, tapering towards the narrow basal end. The spire, which comprises all other whorls, is short to moderately high, with straight or slightly concave sides and a pointed apex. There are usually slight spiral ridges near the base of the shell, the rest is smooth. The shell opening is very long and narrow. The operculum, a plate situated on the foot and used to close the shell opening when the snail retracts inside, is corneous (made of horny substance), narrowly elongated and very small relative to the shell size. The coloration pattern of this beautiful cone is highly variable. The background color is white or bluish white, covered with a network of chocolate to dark brown lines edging small triangles that appear as overlapping textile markings. Yellowish or brown flecks and blotches are arranged in three interrupted bands that spiral around the shell. The aperture is usually white to bluish white, or rarely suffused with pink.